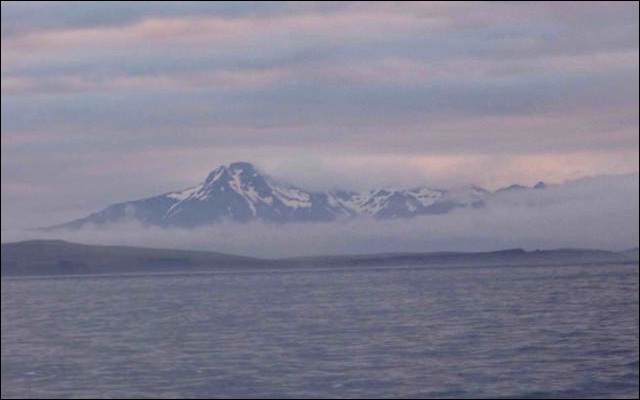 Favourable winds continued on our passage from Victoria in British Columbia to Dutch Harbor in the Aleutian Islands. On day 11 of the 1700 mile passage, as we made landfall at Sedanka Island, to the north of us, the snowy peaks of Unimak Island were bathed in the rosy tints of the setting sun. 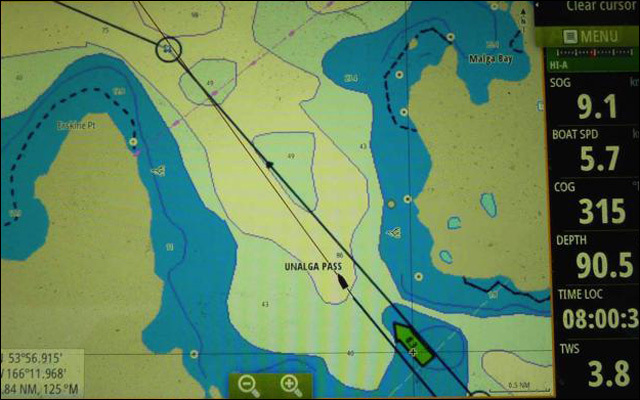 To reach our destination, we still had to negotiate the Unalga Strait known for its fierce tides, so I decided not to attempt it in the falling light but wait for the following morning. Having spent a peaceful night at anchor, at first light we caught the favourable tide through the narrow strait and 15 miles farther on, we entered the land-locked port of Dutch Harbor. Renown as the busiest fishing port in the United States, the 300 vessels based here harvest the rich waters of the shallow Bering Sea for halibut, pollock, all kinds of salmon, as well as king, snowy and other types of crabs. 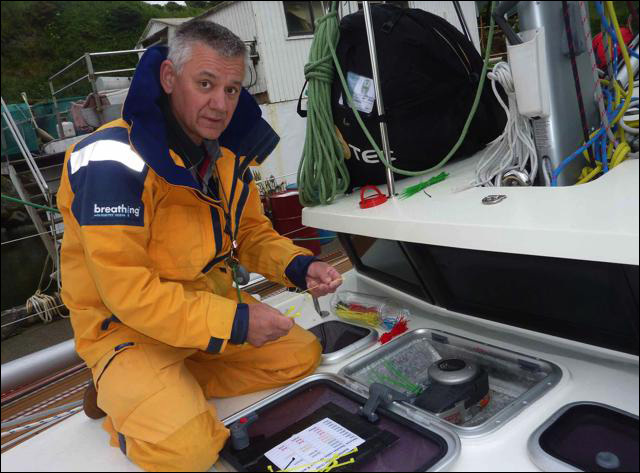 On arrival, we asked permission from the harbourmaster to proceed directly to the fuel dock to fill up with fuel; one of the many jobs in preparation for our forthcoming voyage north. The harbourmaster came to greet us and told us that he had found a place for us in the small board harbor. 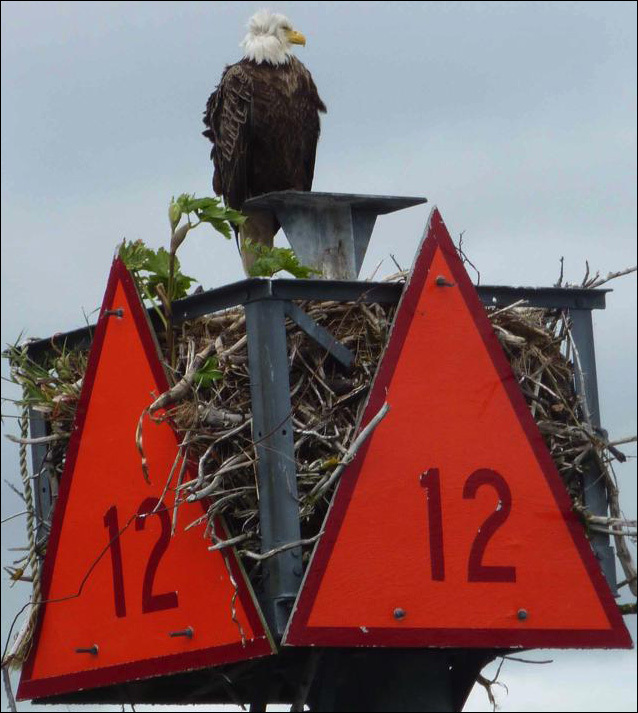 As we made our way through the narrow channel leading into Ililiut Harbor, I was astonished to see perched on top of a channel marker a large bald eagle. 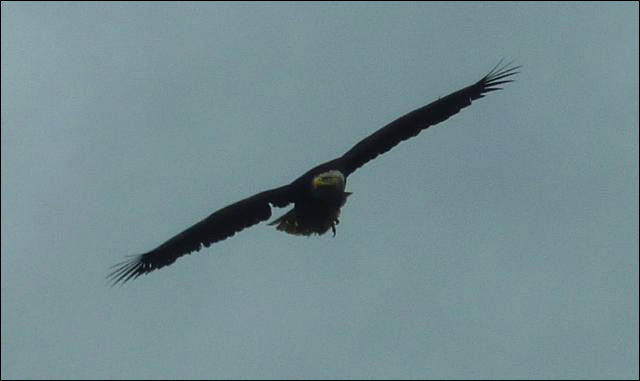 I would have never expected to see this magnificent bird, the symbol of the United States, nesting in this busy harbour, but soon we could see bald eagles everywhere. We were later told that this skilled predator has turned here into a scavenger, attracted by the detritus from the fish processing plants. 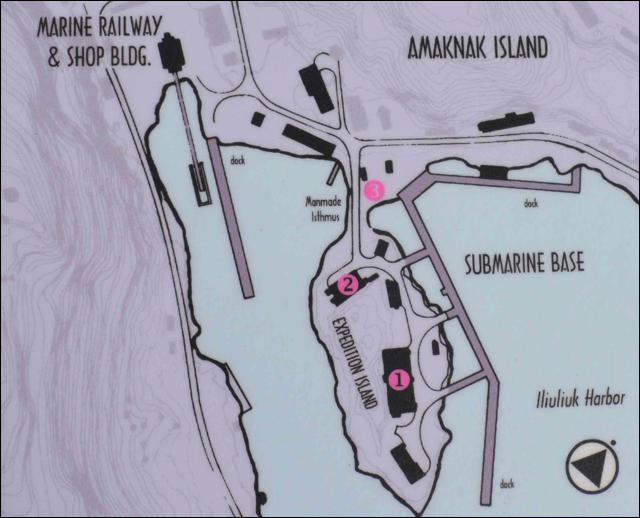 The well-protected small boat harbor started off as a submarine base during the Second World War, when Dutch Harbor was heavily bombed by the Japanese in May 1942. Dutch Harbor is located on Unalaska Island, one of the Aleutian Islands whose chain stretches southwest from Alaska in the direction of Japan. When Russia sold Alaska to the United States in 1867, the Aleutian Islands were part of the deal. 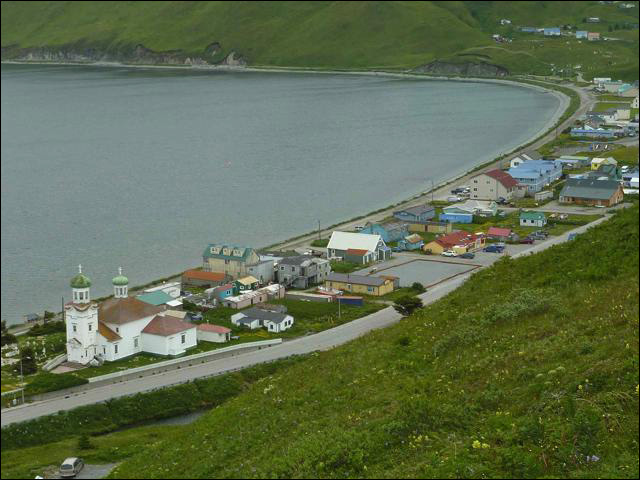 The native population had been converted to the Russian Orthodox faith, and the current Orthodox Cathedral in Unalaska had its origin as a humble chapel built in 1808. 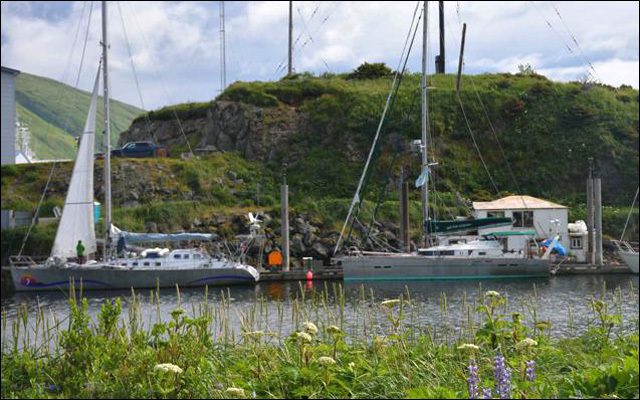 Friends of ours, Seth and Ellen on the yacht Celeste, that is also attempting a transit of the Northwest Passage from west to east this summer, had introduced us to their friends Daneen and Andy who live in Dutch Harbor. 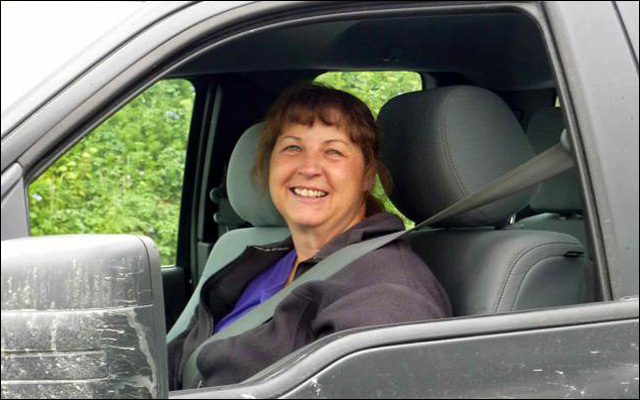 Andy was away, but soon after our arrival, Daneen came by to say hello, and for the rest of our stay proved to be an invaluable help, ferrying us everywhere in her capacious truck, allowing us to go online and do our laundry at her home, earning the title of our Aleutian guardian angel. 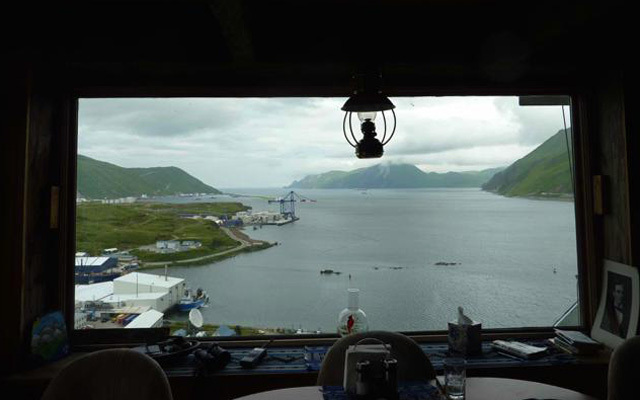 Perched on the top of the highest hill overlooking Unalaska Bay, Daneen’s panoramic window allowed is not only to enjoy the magnificent view, but also the constant flypast by a flock of bald eagles riding the thermal currents. 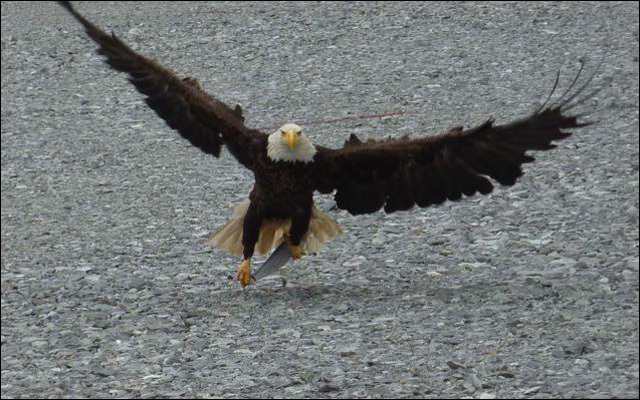 We were suddenly called outside by Daneen, and, as she threw a frozen fish into the air, an eagle swooped down and caught it in its talons. 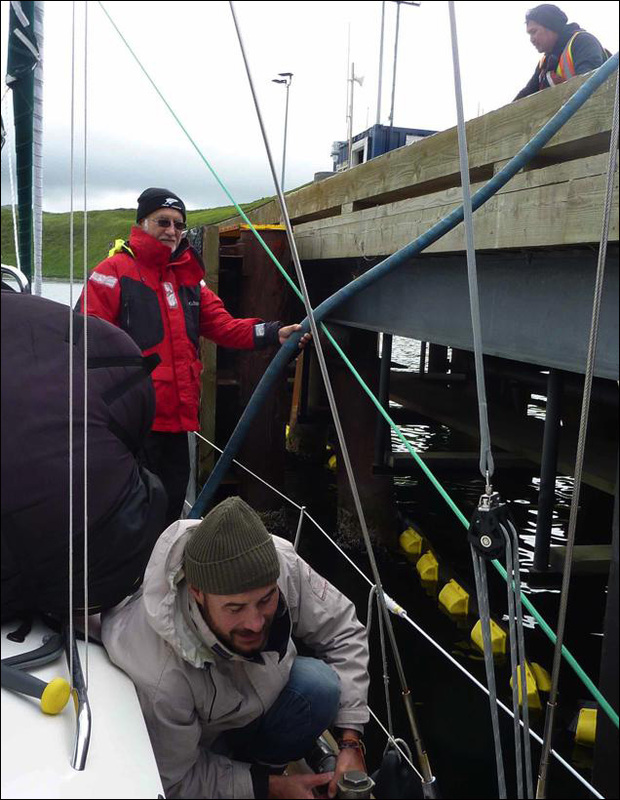 In Dutch Harbor we were joined by our new crew: Chris Eakin, a friend from London, and Martin Frey, from Salt Lake City. With only one day before our planned departure, they were promptly given some jobs to deal with. 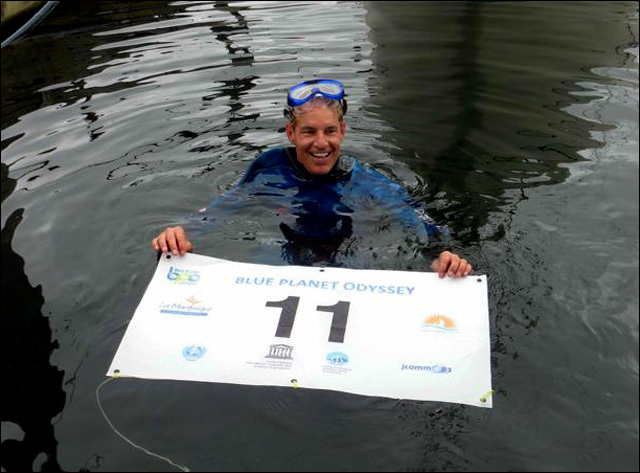 While attaching the Blue Planet Odyssey number to the lifelines, Martin dropped it overboard and had an early taste of Arctic waters as he had to done his dry suit to fish it off the bottom. This 1200 miles passage through the Bering Strait will take us to Point Barrow, at the northwestern extremity of Alaska. According to the latest forecasts, there is still ice around Point Barrow but we expect it to be mostly gone by the time we get there, allowing us to turn east for the challenging part of the Northwest Passage.